As a college student, this is the time where you are starting to count down the days until you can board your flight to your ultimate Spring Break destination. Spring Break is meant to be the time of your life! Beautiful beaches in Cancun and cliff-diving in Jamaica – the setting is perfect for you to have an amazing week. 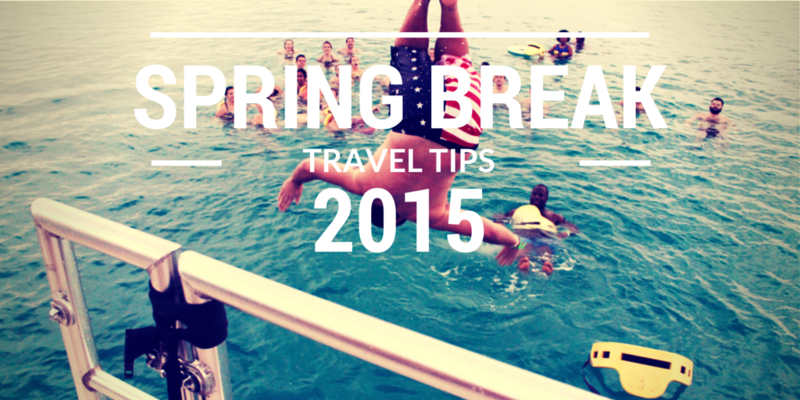 So you can have an amazing week and stay safe, here are a few travel tips so that Spring Break 2015 will be the best! Keep important personal possessions at home! If you have special jewelry, expensive clothing and electronics, be sure NOT to take them with you. You will be too busy enjoying the beach and it is not worth risking anything that could be important to you. Bring sunscreen and tan responsibly. Especially if you burn easily, having a bad burn over your Spring Break can ruin anyone’s good time. No one wants to look like a lobster and be stuck in their hotel room all week. Be sure to bring sunscreen and practice sun-safety! Make copies of your identification, passport and important documents. If you do lose any important documentation, it is crucial to have a copy of it. It makes renewing your items much easier and gives you the peace of mind that you have a back-up plan, just in case! While this may seem old-school, in case of any loss or theft you may need to contact people. Write down important phone numbers, email addresses or other contact information. There is an endless amount of alcohol on Spring Break. We encourage you to drink responsibly and be aware! For example, drinking in hot tubs is not safe, especially if you are alone. Never leave your drink unattended and be sure to see where your drink is coming from and who is opening it. Think twice about swimming while intoxicated, especially as the sun sets. 6. Use the buddy system. You may be going with just one other person or a group of 200, but be sure to always have a buddy and know where they are. This is important because you will always have someone looking out for you! Be sure to get proper vaccines depending on your location of Spring Break. Also be sure to check water and food warnings. For example, stay away from the tap water and ice. In some hotel zones it is safe, but just to be cautious stick to bottle water. 8. “YOLO” is not a thing anymore. Spontaneity is wonderful. Go out and explore; this is your Spring Break of adventure! But be sure to be smart and trust your instincts. If a situation seems unsafe, find someone for help or get your buddy. Find out if you will have service and if there will be wi-fi available at your hotel. Do some research on where your hotel is located, where the nearest police stations and hospitals are. Also be sure to know where the American embassy is located and how to get there if need be. Spring Break 2015 is going to be an amazing time no matter where you go. Hundreds of college students across the country will be in the islands or Mexico with you for the best week of their life. Enjoy!